About Mrs. Cabak - Mrs. cabak'skindergarten class! 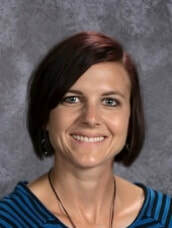 Hi, my name is Andrea Cabak and I have been a Kindergarten Teacher for the past 10 years. I grew up in Finlayson, MN and attended Hinckley-Finlayson High School. From there I attended college at the University Of MN-Duluth. I completed my student teaching in Willow River, MN where I got my first teaching job in Kindergarten for the next six years. I received my Masters degree in Teaching and Learning from Saint Mary's University. My husband and I purchased our first home in Pine City and have been living here the past nine years! We truly love the wonderful things Pine City has to offer. We frequent the local parks and you will most likely see us biking or walking around town. We have a son, Marek, who is 5 years old, a 2 year old daughter, Teigan, and two dogs, Copper and Madii. I love teaching here in Pine City and am looking forward to getting to know my students and their families!